At TOFT we religiously weigh every alpaca on the farm every month come rain hall or shine. This month it was absolutely gorgeous making up for all the rainy days to come. 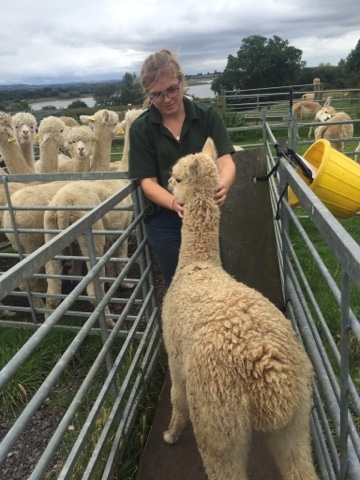 We also check body score and eye lid palour at the same time, taking this regular opportunity to monitor the whole of the TOFT alpaca herd. We weigh in the winter months to ensure that no one is losing weight and weigh in the summer to make sure that no one is gaining an excess. We try to maintain all the mature alpacas between 65-75kg not always easy when some of them want to eat all the pies. The greedy ones end up in the 'fat field' for the winter and the slightly challenged end up in the 'skinny field'. At this time of the year after the joys of summer grazing we expect all the alpacas to have a body score of 3.5 -4 out of 5 max and would expect them to come out of the winter between 2.5-3.5 body score. That's what we aim for as our ideal but with two very mild wet winters on the trot, in which the grass hardly stopped growing, it's a challenge to keep the weight off these extremely efficient grazers.